After learning about the life and works of Vincent van Gogh, the children make paintings using his style. For ages 3 to 9. Plan 1 session. Click here to see three examples of Van Gogh's paintings. Almost every year there is a wall calendar for sale with examples of his paintings to share with the children. Vincent van Gogh is considered one of the greatest and most recognizable painters in history. 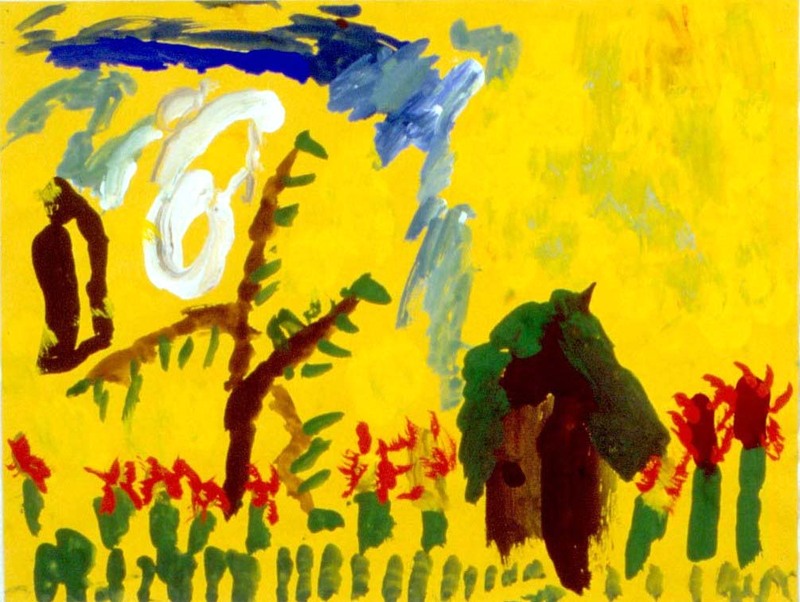 His use of brilliant colors and broad, swirling brushstrokes were important influences on painting in the 20th century. Van Gogh was born on March 30, 1853 in Groot-Zundert, Holland. The oldest of six children, he was very popular with his siblings and formed a special bond with his younger brother Theo. At eleven years old, van Gogh was sent to a boarding school where he missed his family very much. Throughout his life, van Gogh corresponded with Theo by writing letters which often included sketches. Theo was so impressed by these drawings that he encouraged van Gogh to become an artist. 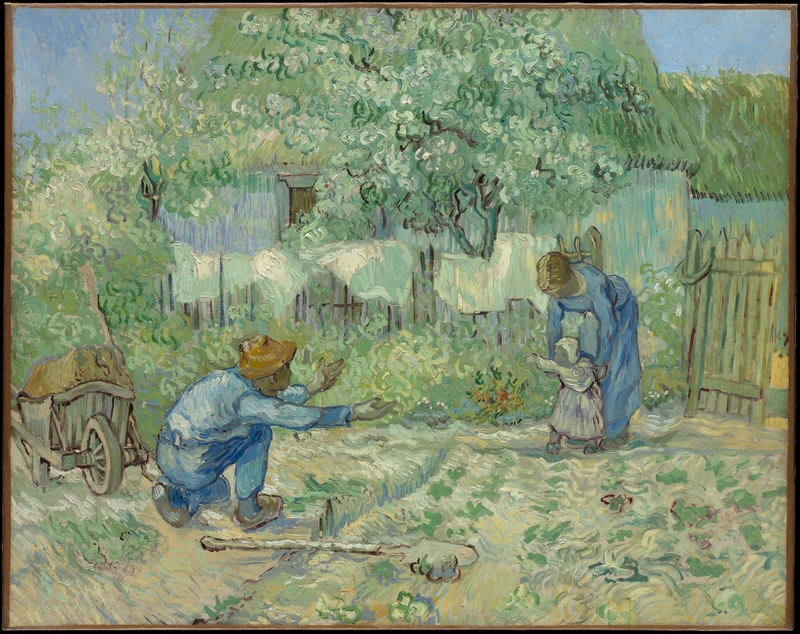 For four years, van Gogh sketched and learned to use watercolors while Theo supported him financially. In 1886, van Gogh went to Paris where he was strongly influenced by the Impressionist painters who painted with dabs and short strokes of primary unmixed colors, applying them directly on the canvas to simulate reflected light. However, unlike the Impressionist who concentrated on the actual appearance of the subject matter, Van Gogh focused more on the personal experience or emotion of the painter - a style later named Post-Impressionism. Using pure, brilliant colors with long and short brush strokes of thick paint, he covered the canvas with passionate, vibrant movement, working loosely and quickly, but never carelessly. 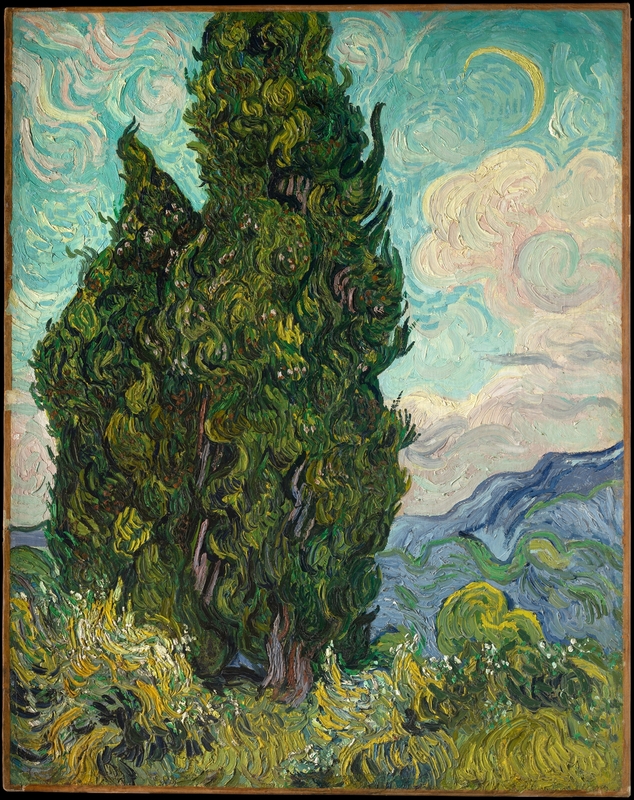 Due to bouts of illness, van Gogh was hospitalized in 1889, where he continued to paint many of his most compelling works, such as Cypresses, The Flowering Orchard, First Steps, after Millet, and Wheat Field with Crows. Van Gogh died in 1890 at the age of thirty-seven. Although only one of his paintings was sold during his lifetime, his works later obtained some of the highest prices ever paid for paintings. Become familiar with the life and paintings of Vincent van Gogh. Set out construction paper, paints, brushes, containers of water, and sponges. Gather examples of van Gogh’s paintings. Tell the children about Vincent van Gogh and share the examples of his paintings, making sure that the children understand that the examples are only reproductions, or pictures, of the actual paintings. Explain that in this session the children will be making paintings using van Gogh’s style. Looking carefully at van Gogh’s paintings, point out how each brushstroke is still visible. He painted with short and long, sometimes swirling or twisting brushstrokes without blending or mixing the colors. Demonstrate how to dab the paint gently on the paper while lifting the brush without blending the strokes. Encourage the children to paint bright and bold colors directly on their papers. Point out how van Gogh reflected colors in his paintings, such as the yellow brushstrokes of the moon and stars in the sky of The Starry Night or the blue color of the sky dabbled throughout in First Steps, after Millet. Explain that the children should complete their paintings in one session working like van Gogh, quickly but carefully. 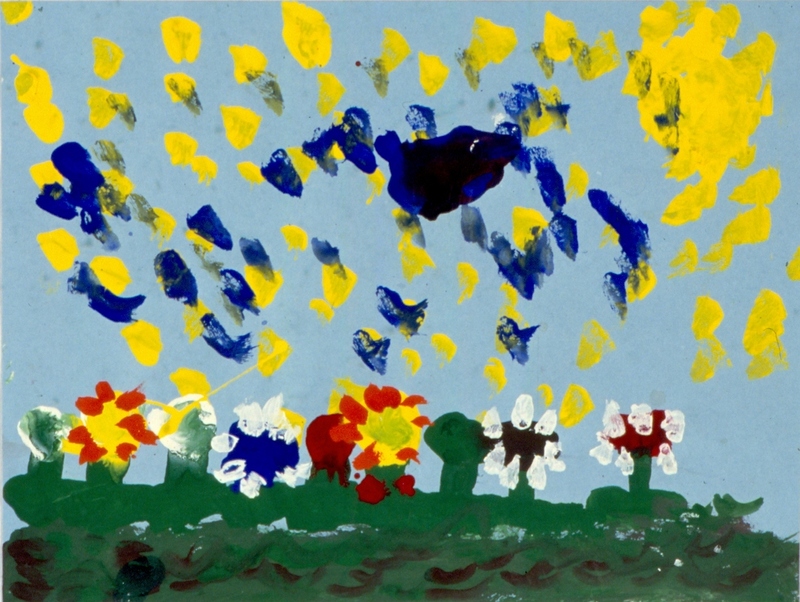 Have the children choose a color of construction paper and make their paintings, reminding them that the strokes of paint should remain visible. 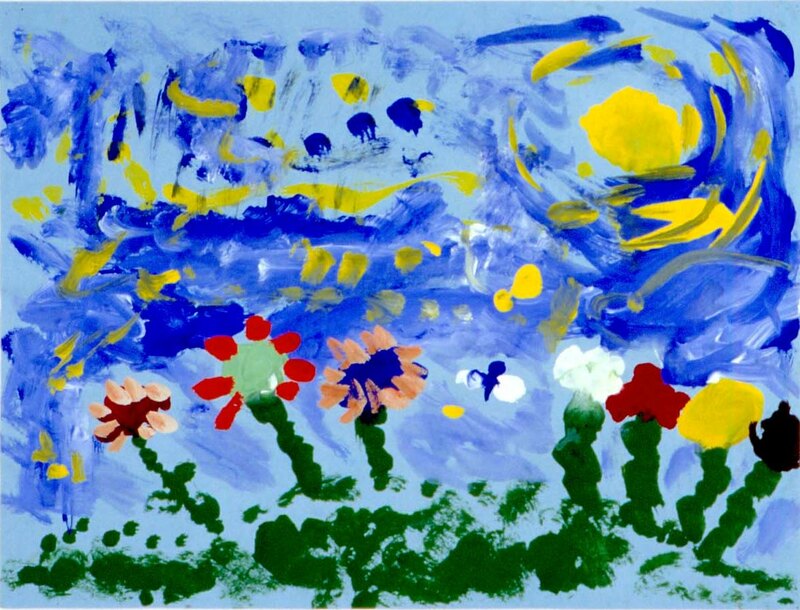 When working with children, concentrate on teaching van Gogh's style of painting. Don't discuss the details of his tragic life, much of which has been historically questioned. Keep the papers small because, even though the children have fun painting dabs with their brushes, they tire quickly. Colored construction paper will fill the background and give the paintings a more completed look. 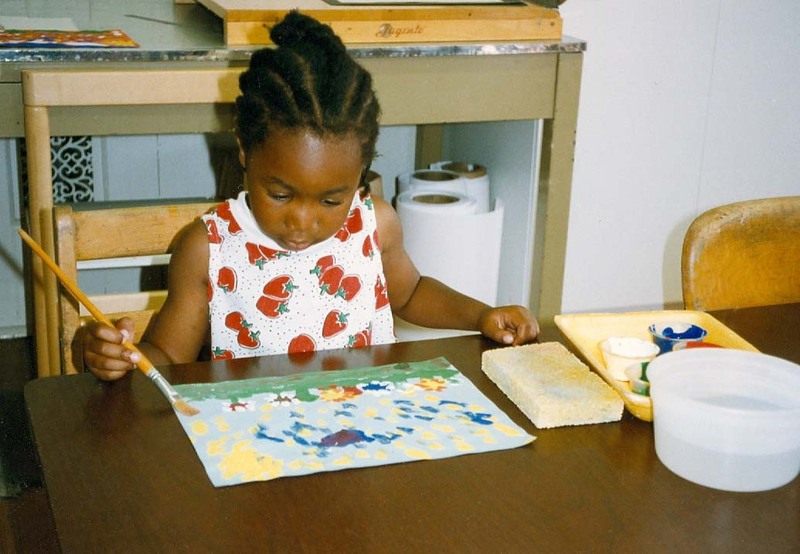 Some children will slip back into mixing their colors and painting with flat color. After a few reminders to allow their brushstrokes to show, let them paint. Be careful not to turn the lesson into a negative experience. Point out the visible brushstrokes in the children’s paintings. Have the children explain how they felt while painting in the style of van Gogh. Discuss with the children whether they would use this style in their future paintings. I want to make the blue for my sky on a mixing tray. Uh oh! I forgot to dab. I’m tired of making dabs. I think I’m finished. I really like painting like van Gogh. Since we are working like van Gogh, try painting dabs of blue directly on your paper. If you accidentally blended your brushstrokes, you can dab more paint directly on top of the same area. You only need to make enough dabs to experience how van Gogh painted. If you liked working in van Gogh’s style, you might want to use it again in other paintings that you do.